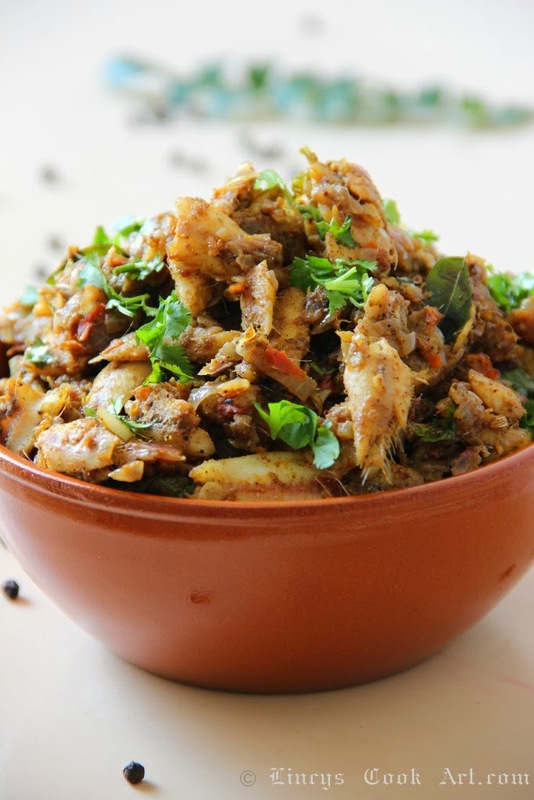 Netholi Pepper Roast is, a yet another must try dish. I was just trying out different combinations and came up with this wonderful dish 'Anchovy Pepper Roast'. This is also a finger licking recipe. Heat oil in a pan and add the fennel seeds once you get the smell of them add the onion and cook till it becomes soft. Then add the green chilli, ginger,garlic and strand of curry leaves; cook till the raw smell leaves . Add tomatoes and salt; cook in high flame to avoid the water oozing out from tomato to dry up. Add anchovies and masala powders such as turmeric, chilli powder, coriander, garam masala, pepper powder and salt immediately. Otherwise the fish cooks up way too soon and starts to shred from the beginning and you will end up with a mashed up fish roast. Keep the flame to medium high so that the water oozing out from fish also dries up and you will end up with the nice fish roast. Avoid frequent stirring, and stir gently once in a while to just mix the masalas to coat the fish. Atlast add curry leaves and cook for a minute and switch off the gas. Note: Adding tomatoes is optional in this recipe. But it adds slight tangy taste and also volume to this dish. Looks so yummy....kothiyayittu vayya :) Lovely clicks dear !! VEry tempting dish Lincy super pics too. Awesome clicks and a lovely recipe! thxs for visiting my space n ur lovely comment..super tempting roast! !